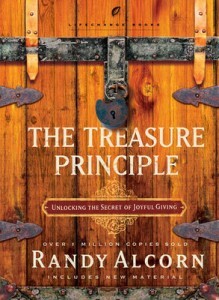 This series, based on the book The Treasure Principle by Randy Alcorn, will help us discover the joy of giving. In this message we see that Jesus wants his followers to think about eternity when it comes to our money and possessions. 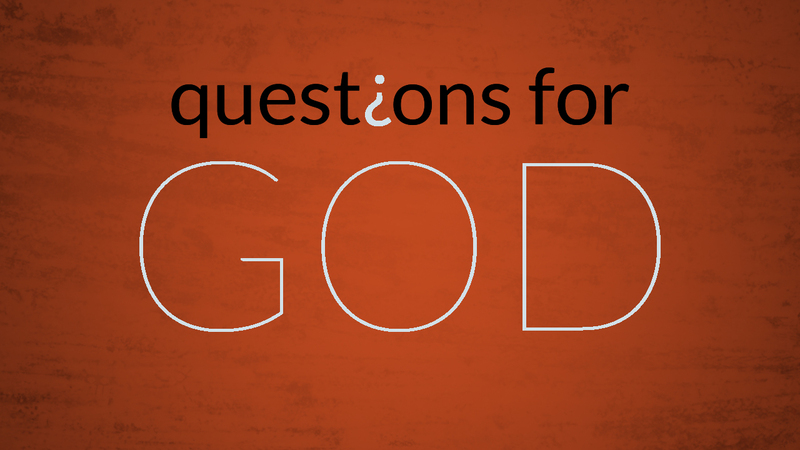 As we continue our series focusing on Randy Alcorn’s book The Treasure Principle, we have been looking at some “Questions for God” each week in our Wednesday Night Study. 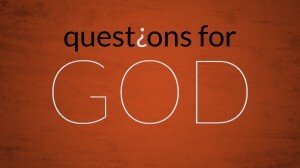 The purpose of these “Questions for God” is to prompt you to honestly approach your heavenly Father with uncertainties, fears, joys, and new discoveries. I encourage you to pray these questions to your Father, and note any responses He provides through His Word, the Holy Spirit, or wise fellow believers. 1) Do I really believe that You have made me to be a giver? Am I convinced that I will feel Your pleasure when I give? God, help me to believe and to trust You enough to give. 2) God, am I treating You as owner and CEO of “my” assets, or am I treating You merely as my financial consultant, to whom at best I pay a fee in the form of offerings? 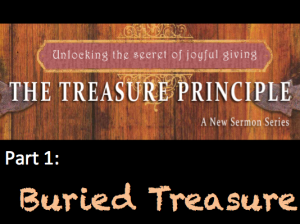 This Sunday, we will continue our series called The Treasure Principle from the book by Randy Alcorn. We will see that Jesus would often point people to think beyond the here and now- beyond the physical world- and provide an eternal perspective. This is certainly true when we consider how we use our money and resources. To prepare, read Luke 16:1-15. As you read this parable, try to see what Jesus is saying to his disciples– and how this applies to us too. 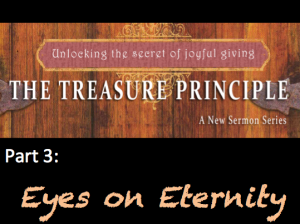 My prayer is that the Holy Spirit will teach us in the sermons, our individual reading of The Treasure Principle, and our Wednesday night group time. 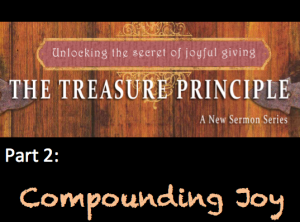 Discover a joy more precious than gold! Priceless treasure is within your reach. And with it, liberating joy. In Randy Alcorn’s The Treasure Principle, you’ll unearth a radical teaching of Jesus– a secret wrapped up in giving.Once you discover this secret, life will never look the same. And you won’t want it to. 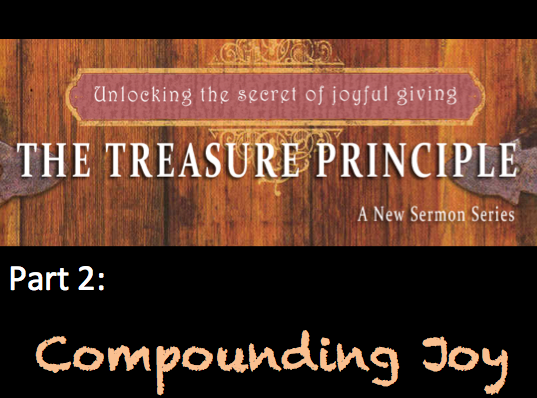 In this message we see that promises some incredible things when we give back to him. On Wednesday May 18th, we will start this 6 week study. We meet in the Fellowship Hall (same as Sunday morning) from 7:00pm-8:30pm. Books will be available, free of charge, on Sunday, May 8th and Sunday, May 15th. In this message we see that we are to seek after a treasure– it’s just not of this world. 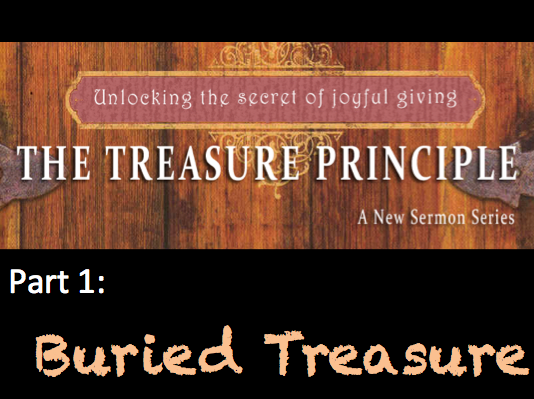 This Sunday, we will begin a new series called The Treasure Principle. Will will use the book by Randy Alcorn to help guide us through Biblical views on giving, generosity, money, and possessions. These are important topics to each of us– and the Bible has a lot to say about them. 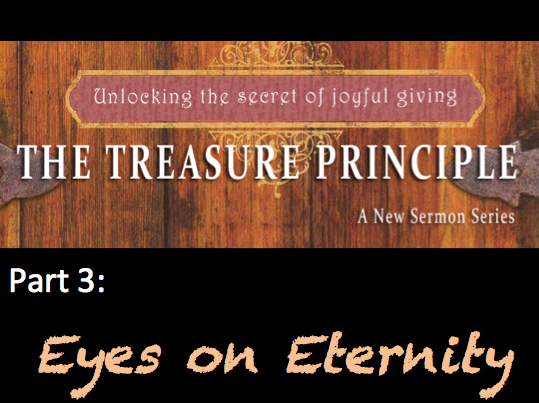 Make sure to pick up a copy of The Treasure Principle to read as we go through this six-week series together. Also, join us for our Wednesday night study where we will delve even deeper into these issues. This week, we discover the value of the kingdom of God– and how we can respond to it. To prepare, read Matt. 6:19-21 (this is, according to Randy Alcorn, the treasure principle), Matt. 13:44, and Matt. 19:16-26. Series: The Vision of Grace Family Fellowship: Who Are We? In Luke 15, Jesus gives us a picture of God and how he views lost people. It is radical and scandalous that God would treat sinners the way Jesus say he does. It is also amazing how he treats the self-righteous religious folks. .It is so incredible, we should be celebrating all the time! 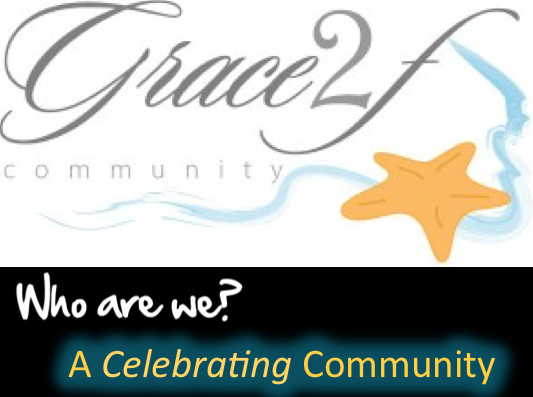 Series– The Vision of Grace Family Fellowship: Who Are We? This Sunday, we will conclude our series asking the question: Who Are We? In Luke 15, we see Jesus telling people about the heart of the Father for his lost children. There is a pattern: something is lost; the Father searches for it; the Father finds it; there is a great celebration in heaven. This is, indeed, good news… For everyone who realizes they are lost and then found. This week we see that some people never realize their “lostness”. This means they never accept the love of the Father and, instead, resent the grace he offers. To prepare, read Luke 15– focusing primarily on verses 11-32. Also, we will be celebrating the birth of Colton with Joseph and Kairi this Sunday. If you are able, bring in a gift card to present to the new mom and dad (Walmart, Target, etc.). My wife, Sara, will have a basket that we will use to hold the cards– so please give your gift card to her when you arrive. Each Wednesday we meet in the Fellowship Hall of Faith Community Church. The study starts at 7:00pm and goes until around 8:30pm. We will be discussing the sermon topic from the previous Sunday. In Luke 15, Jesus gives us a picture of God and how he views lost people. It is radical and scandalous that God would treat sinners the way Jesus say he does. It is so incredible, we should be celebrating all the time!